Passing air through a filter is the most convenient method to remove particulate matter (see Figure 5.10.4). Before filtration is used to obtain a sample, however, the purpose of the sample should be considered. Many filters collect particulates efficiently, but thereafter removing the collected matter may be impossible except by chemical treatment. If samples are collected for the purpose of examining the particles and measuring their size or noting morphological characteristics, many filters are not suitable because the particles are imbedded in the fibrous web of the filter and cannot readily be viewed or removed. If the sample is collected for the purpose of performing a chemical analysis, the filter must not contain significant quantities of the substance. If the purpose of sampling is to collect an amount of particulate matter for weighing, then a filter which can be weighed with the required precision must be selected. Many filtration materials are hygroscopic and change weight appreciably in response to changes in the relative humidity. Filters can be made of many substances, and almost any solid substance could probably be made into a filter. In practice, however, fibrous substances, such as cellulose or paper, fabrics, and a number of plastics or polymerized materials, are generally used. The most readily available filters are those made of cellulose or paper and used in chemical laboratories for filtering liquids. These filter papers come in a variety of sizes and range in efficiency from loose filters that remove only larger particles to papers that remove fine particles with high efficiency. All filters display similar behavior, and ordinarily a high collection efficiency is accompanied by increased resistance to airflow. FIG. 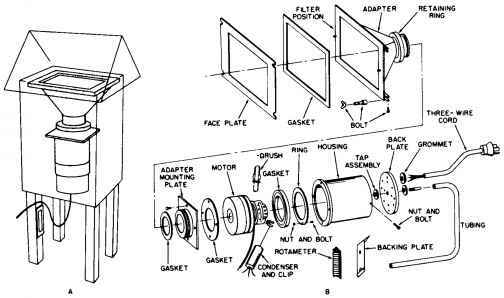 5.10.4 High-volume sampler: (A) assembled sampler and shelter; (B) exploded view of typical high-volume air sampler. esters or other polymeric substances that form a smooth surface of predictable characteristics. Such filters contain many small holes, or pores, and can be made to exacting specifications so that their performance characteristics can be predicted. In addition, the filters usually have high chemical purity and are well suited to trace metal analyses. Some membrane filters can also be transparent and thus permit direct observation of collected particles with a microscope. Alternatively, the filters can be dissolved in an organic solvent, and the particles can be isolated and studied. Most membrane filters are not affected by relative humidity changes and can be weighed before and after use to obtain reliable gravimetric data. Another kind of filter that is widely used in sampling ambient air is the fiberglass filter. These filters are originally made of glass fibers in an organic binder. Subsequently, the organic binder is removed by firing, leaving a web of glass that is efficient in collecting fine particles from the air. The principal advantages of using this type of filter are its low resistance to air flow and its unchanging weight regardless of relative humidity. However, these filters are not well suited to particle size studies. In addition, they are not chemically pure, and the environmental engineer must ensure that the filter does not contribute the substance being analyzed in unknown quantities. In the United States, most data relating to suspended particulate matter in our cities have been obtained on filters made of fiberglass and used in conjunction with a sampling device referred to as a high-volume sampler (see Figure 5.10.4). Many other kinds of filters are available, but most sampling needs are well met by membrane or fiberglass filters.